Don't agree that "all" the people here are hating. I only see two posts flaming. What is too loud to one person would be too quiet for another, its subjective. You said "majority" when the majority here is posting their opinion which is what this forum is about. Why join a forum if you can't take opinion that doesn't line up with yours? Its what makes forums fun. Some members here find flaming entertaining. The majority of the seasoned enjoy helping the newbs settle in on this forum. Gotta earn your stripes. Got the exhaust in earlier. More content coming soon. Haven’t done a bumper tuck yet either. My review so far there’s zero drone on the hwy it’s only loud when you want it to. It’s not too loud but deep so nothing annoying about it. Driving normal and shifting at 3k rpm is extremely smooth you won’t be disturbing none of your neighbors. You get a slight crackle when letting go of the gas at 3k rpm and up. Installation was simple, I didn’t have any issue with it touching the sway bar or frame underneath. Easy to use with the stock hangers. You will have to reuse the 2 nuts that connects to the y pipe. It only comes with gaskets for the Y-Pipe and connection to mid pipe and a set of bolts and nuts for the mid pipe. Amazing quality, vids and photos will be posted tomorrow! Last edited by J350ZNC; 03-30-2019 at 02:01 PM. So I wanted to wait a couple days before I give my final review. 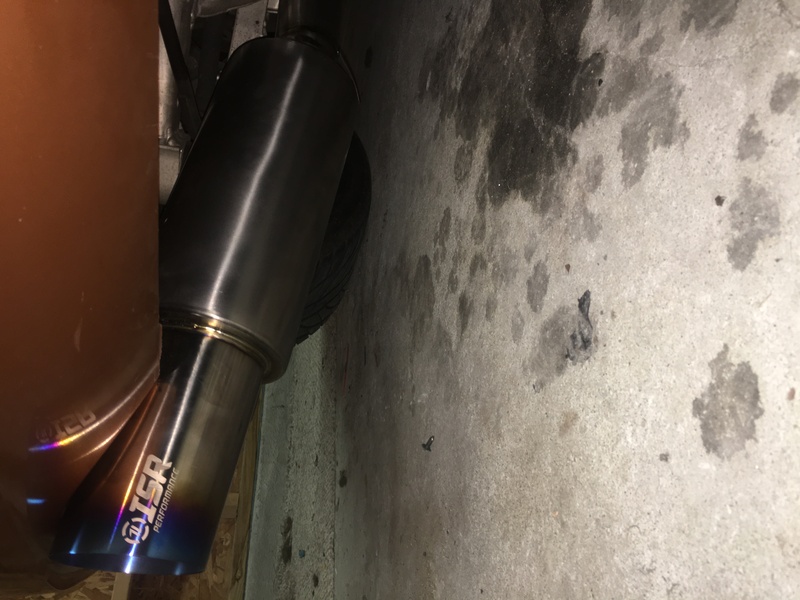 First I’d like to say this exhaust is amazing and love it to death! It really woke my car up and for a guy who never like single exhausts ever to now be in love with one is a sign. So overtime the quality and durability will be tested but so far it is a great quality titanium exhaust and is well made to fit the Z perfectly with no issue. It also has a small guard underneath the muffler to block against scraping which is a nice touch since I see Tomei’s scraped up all the time. It sticks out perfect and the burnt tip really gives it such a clean look. ISR definitely put in some work on making an awesome looking exhaust system. For the sound it is the perfect note and I would be crazy to add test pipes or headers to it unless you’re someone who literally wants to squeeze every bit of hp you can get, but then you’ll have an obnoxious Z that sounds like crap. There is some deep drone on the highway going 75 that isn’t even annoying to be honest but is there. There are times when it slightly hits the very loud meter but since its not raspy it still sound amazing. It’s decent noise on a cold start but when its warmed up its close to silent at idle which I like because then you’re just ready to take off and hear that ISR’s deep tone again. To clear it up it’s as loud as a regular mustang gt, corvette, sti or something so it doesn’t scream going down the road. You’ll never get enough of the sound and it was pretty fun putting on since it was very straight forward. Hope I convinced whoever is on the fence to get this instead of a Tomei or instead of any exhaust over $1k because this one definitely does the job. Finally had a chance to watch (listen?) to the vid. That thing sounds pretty damm good. Sounds like a viable alternative to the Expreme for the singles crowd. Good vid covering all the bases (even though I skipped through to the driving segments.) Solid review right there. Great to hear a very positive review! I would instantly buy it too but I'm fearful of the noise for track days here in the UK.